According to some new rumors, Lenovo will officially launch two new smartphones at an event to be held in China in the coming days. 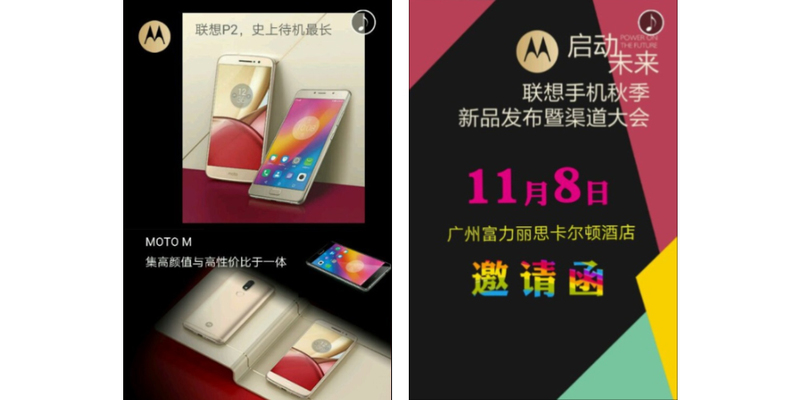 The two devices in question are the Lenovo P2 and Lenovo Moto M. The source of this information would be precisely Lenovo, which has begun to give invitations to attend the press conference held on November 8 in Guanzhou, China. The Lenovo P2 is not a completely new cell phone to the public, because in fact had already been presented at the IFA 2016 last month, but has yet to make its official debut on the market. It is a upper-middle range device, equipped with a 5.5-inch Full HD screen, Qualcomm Snapdragon 625 chipset with Adreno 506 GPU and a battery of 5100 mAh (the most striking spec). It will have two different variants, one for Europe with 3 GB of RAM and 32 GB of internal memory, and other destined for the Chinese market with 4 GB of RAM and 64 GB of internal memory, both with front camera of 5 megapixels and rear camera of 13 megapixels. The (Motorola) Moto M for its part has already been known thanks to some leaks which also include photos taken live (and which we discussed here). This future addition to the Moto family, known as Kung Fu or the model code XT1662, will be a mid-range smartphone, equipped with 5.5-inch Full HD screen, MediaTek MT6755 chipset and octa-core processor at 2.1 GHz and Mali-T860MP2 GPU, 4 GB of RAM and 32/64 GB of internal memory. To complete specifications, it has a 16-megapixel rear camera, 8-megapixel front camera, fingerprint scanner and Android 6.0 Marshmallow operating system. We can not deny the fact that Lenovo is working hard to revive sales success of some older devices. Many users of Lenovo appreciate especially the quality/price ratio, and will not be different for these two new smartphones developed by the Chinese brand that could be presented on 8 November. Therefore, the idea of ​​providing a competitive price will be key to attract many more users than usual in recent months.